Defending champion Rafael Nadal closed out a 7-6 (8-6) 7-6 (7-5) 6-0 win over Luxembourg's Gilles Muller after their rain-hit match resumed at Wimbledon. The Spaniard, who edged a first-set tie-break on Friday evening, was initially matched service game for service game by Muller once again. But Muller dumped a backhand into the net to allow the second to slip away and then disintegrated in the third. Nadal will face 24th seed Juan Martin del Potro in the fourth round. 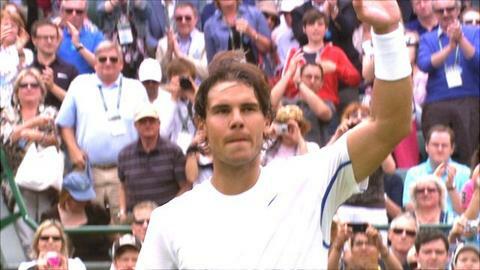 "I started the match without some rhythm and it is difficult because it is like a lottery," Nadal told BBC Sport. "But I was pleased with how I played in the tie-breaks especially today. I got all of my first seves in and was returning well. But I am pleased to get through." Muller knocked Nadal out of Wimbledon at the second-round stage in 2005 and the Luxemburger proved that he still carried a threat as he twice came within a point of taking the opening set on Friday evening. Nadal prevailed 8-6 in a tie-break before the rain descended and forced play to be suspended until Saturday. The break in proceedings did little to change the flow of the match however as Muller's power gave him a fighting chance of upsetting the number one seed. Nadal failed to get the ball back over the net in a dominant first service game from Muller and on occasions found himself in the unusual position of being outmuscled in an exchange of forehands with his fellow left-hander. Despite Muller's 17 aces through the match, Nadal kept up his end to remain unbroken through the tie-break and then pounced when a Muller backhand had strayed into net. The world number 92's spirit was broken and the final set proved a far more relaxed affair for Nadal. Three swift breaks and 31 minutes later he was able to begin his prepapartions for an intriguing meeting with 2009 US Open champion Del Potro in the last 16. The Argentine defeated Nadal in the third round of his successful Flushing Meadows campaign and he showed glimpses of the sort of power that once took him to fourth in the world in a 7-6 (10-8) 7-6 (7-5) 7-5 win over France's Gilles Simon. I don't know if I will have a little chance or not, but I will try to make a good game. A wrist injury kept Del Potro out of the game for almost a year after his Grand Slam success but the 126mph ace that sealed his progress was typical of a commanding performance. The 22-year-old played down his chances of a repeat victory over Nadal however. "We played this year in Indian Wells and he won really easy. He's the number one and will be the big favourite for the match," he said. "Playing on grass, for the South American players, is not easy but I want to be ready. "I don't know if I will have a little chance or not, but I will try to make a good game. "To beat Rafa you have to play unbelievable tennis. You should play everything perfect and then maybe you have a little chance. "It's going to be very tough for me but it's my first time in the fourth round here and I want to treasure this moment."